with J.S. Maas & Co., Ltd., London. Anon. Sale, Sotheby's, New York, May 20, 1993, lot 199. The named sitter was born July 15, 1716, the daughter of Sir William Courtenay, 2nd Bart., de jure 6th Earl of Devon and Lady Anne Bertie, daughter of James, 1st Earl of Abingdon. Isabella married John Andrew, M.D., of Exeter on May 14, 1744. 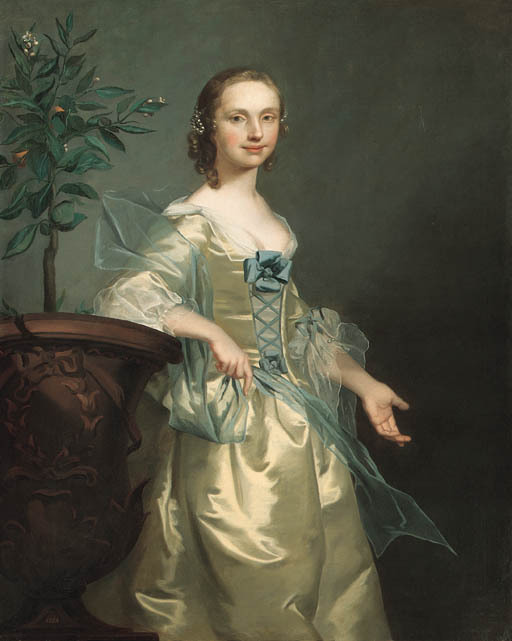 However, the age of the alleged subject in 1751 does not seem to match the apparent age of the sitter depicted. The Courtenay family were Hudson's most constant patrons over a span of thirty years. Sir William Courtenay of Powderham Castle, Devon commissioned a wide range of work including portraits and sea-pieces, between 1728 and his death in 1735. His son, also Sir William, continued the patronage which culminated in the massive family group of 1756, (Earl of Devon's Trust, Powderham Castle, Devon). Consequently it is possible the sitter is a different family member. The 7th Earl, for instance, had five daughters, and the 8th Earl had thirteen.